This weeks TOP5 selection is done by Slovenian musical duo Silence. Silence is electronic, piano duet from Slovenia. Band members are Boštjan Hladnik & Boris Benko – or just Hladnik & Benko. Hladnik is taking care of the piano and Benko is a singer. Ma non troppo (1997), Unlike a Virgin (1999), Vain, a Tribute to a Ghost (2004) & Key Silence (2006). They also produced Laibach album VOLK in 2006. In the last years they are mainly doing music for theatre shows. They are collaborating mostly with Tomaž Pandur , Matjaž Pograjc & Primož Ekart. 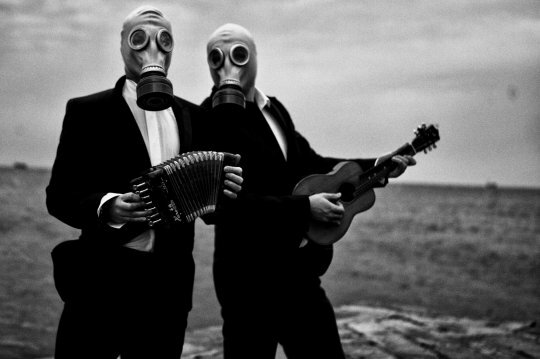 They released their new album on 14.4.2012 titled ” Musical Accompaniment for the End of the World”. Singles from the album are: Death is New York, Electricity, Heart of a darkness. All three videos include parts of Boštjan Hladnik movies. Documentary film about the making of the new album – Watch. Follow Silence home page & FB Page & Soundcloud page & their YT channel.